[NOTE: This DLC will only work in conjunction with Part 1 of BioShock®Infinite: Burial At Sea – Episode 2, which split across 2 downloadable packages. If you own the BioShock Infinite Season Pass, please download Part 1 in game at no additional cost. If you DO NOT own Season Pass, please purchase Part 1 to enable this content.] BioShock Infinite required; sold separately. Xbox LIVE free membership required. See the world through Elizabeth’s eyes in BioShock Infinite: Burial at Sea – Episode Two. 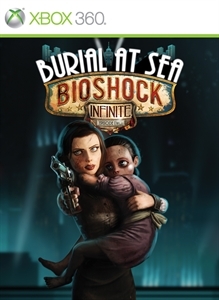 Set immediately after the conclusion of Burial at Sea - Episode One, this final episode puts you in the role of Elizabeth as she journeys through Rapture in an effort to rescue the little sister she abandoned. Burial at Sea - Episode Two is the last of three BioShock Infinite add-on packs and it concludes the storyline of BioShock Infinite and Burial at Sea. This pack will contain new Achievements.